This CellML model has been curated, the units are consistent and the model runs in COR and PCEnv to replicate the published results. Abstract: The results of the accompanying electrophysiological study of the cloned Na/glucose cotransporter from small intestine (Parent, L., Supplisson, S., Loo, D.D.F., Wright, E.M. (1992) J. Membrane Biol. 125:49-62) were evaluated in terms of a kinetic model. The steady-state and presteady-state cotransporter properties are described by a 6-state ordered kinetic model ("mirror" symmetry) with a Na:aMDG stoichiometry of 2. Carrier translocation in the membrane as well as Na and sugar binding and dissociation are treated as a function of their individual rate constants. Empty carrier translocation and Na binding/dissociation are the only steps considered to be voltage dependent. Currents were associated with the translocation of the negatively charged carrier in the membrane. Negative membrane potential facilitates sugar transport. One numerical solution was found for the 14 rate constants that account quantitatively for our experiment observations: i.e., (i) sigmoidal shape of the sugar-specific current-voltage curves (absence of outward currents and inward current saturation at high negative potentials), (ii) Na and voltage dependence of K_0.5_sugar and i_max_sugar , (iii) sugar and voltage dependence of K_0.5_Na and i_max_Na, (iv) presteady-state currents and their dependence on external Na, aMDG and membrane potential, and (v) and carrier Na leak current. We conclude that the main voltage effect is on carrier translocation. Na ions that migrate from the extracellular medium to their binding sites sense 25 to 35% of the transmembrane voltage, whereas charges associated with the carrier translocation experiences 60 to 75% of the membrane electrical field. Internal Na ion binding is not voltage dependent. In our nonrapid equilibrium model, the rate-limiting step for sugar transport is a function of the membrane potential, [Na]o and [aMDG]o. At 0 mV and at saturating [Na]o and [aMDG]o, the rate-limiting step for sugar transport is the empty carrier translocation (5 sec-1). As the membrane potential is made more negative, the empty carrier translocation gets faster and the internal Na dissociation becomes increasingly rate limiting. However, as [Na]o is decreased to less than 10 mM, the ratelimiting step is the external Na ions binding in the 0 to -150 mV potential range. At 0 mV, the external Na dissociation constant KNa' is 80 mM and decreases to 24 mM at -150 mV. The external sugar dissociation constant KNaS' is estimated to be 200 microM and voltage independent. Finally, the internal leak pathway (CNa2 translocation) is insignificant. While we cannot rule out a more complex kinetic model, the electrical properties of the cloned Na/glucose cotransporter are found to be adequately described by this 6-state kinetic model. Schematic diagram of the Parent et al 1992 SGLT1 model. C' represents the external-facing carrier. 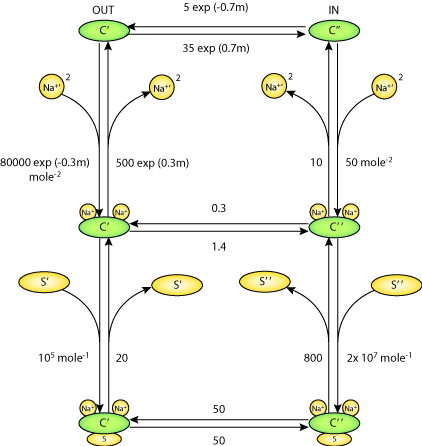 C'' represents the internal-facing carrier. Derived from workspace Parent, Supplisson, Loo, Wright, 1992 at changeset 435886e9aec9.